Have you ever gotten out of bed in the morning with a growling belly and a yen for a big bowl of cereal…only to find that the milk you’ve just poured on your Golden Grahams is chunky and disgusting? It’s a first-world problem, perhaps, but still pretty frustrating. The Milkmaid is a milk jug that will never let you experience this kind of disappointment again. 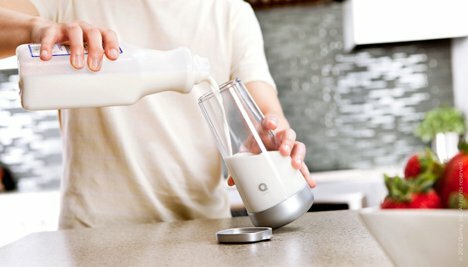 Created through a partnership between GE Labs and crowdsource manufacturers Quirky, the Milkmaid monitors the amount of milk you have left as well as its level of freshness. Apparently, milk has an ideal pH level. And when that level starts to drop, your milk is starting to go bad. The Milkmaid has sensors on its base that keep track of the pH level and sends you a text message to let you know that your leche is taking a turn for the worse. The integrated iPhone app also lets you know when you are running low on milk and need to make a trip to the supermarket. According to Quirky, the product is not only a futuristic home object – it is also an homage to the beautiful thick glass milk pitchers of the mid-20th century.